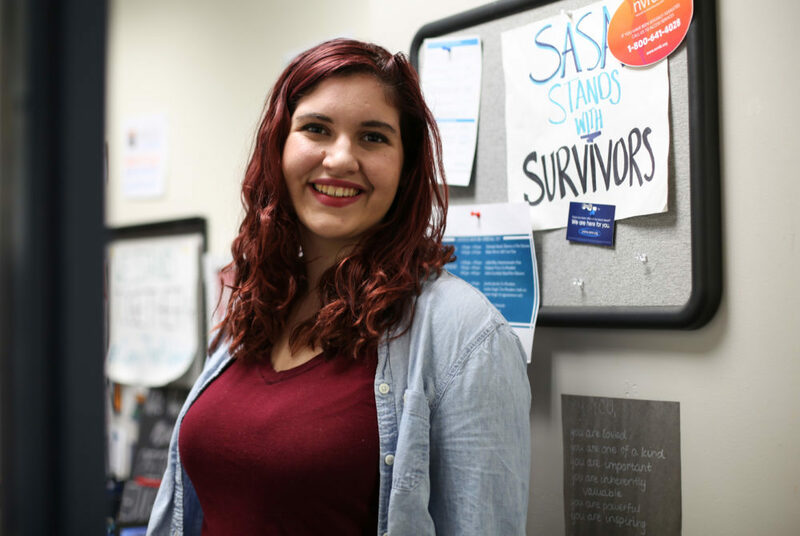 Jocelyn Jacoby, co-president of Students Against Sexual Assault, said a town hall meeting about sexual assault prevention should start a larger campus conversation. The meeting was the first public event hosted by the Committee on Sexual Assault Prevention and Response. The Committee on Sexual Assault Prevention and Response hosted its first-ever public event Wednesday to hear how student organizations are preventing campus sexual assault. About 120 students attended a sexual assault prevention town hall to discuss what they are doing to address the topic of sexual assault and how the University can promote prevention education. Students on the committee, who organized and led the town hall, said the committee will plan future programming based on information from the meeting. Erika Feinman, the president of the Student Association and a member of the committee, said students on the committee proposed the idea of the town hall and developed the event over the course of the semester. Students planning the town hall decided the event should focus on finding out what student organizations are doing to prevent sexual assault and if they need more direction, Feinman said. The Committee on Sexual Assault Prevention and Response was created in October 2014. The committee is made up of about 35 students, staff and faculty members who meet monthly and report to the provost’s office. We really wanted to make this as student-focused and peer-to-peer as possible. Students sat around tables at the town hall, which media was not allowed to attend, to hear prompts from student committee members about bystander intervention and situations they may encounter, Feinman said. “We really wanted to make this as student-focused and peer-to-peer as possible, because we feel like that is the most successful way to get students to speak openly about their experiences,” Feinman said. Feinman said the committee sent emails through OrgSync to all student groups and tried to have representatives from every student organization, but some groups sent more than one student. There are about 450 student groups currently registered with the University. Students filled out a survey at the end of the town hall where they answered detailed questions about their experiences of sexual assault education within their organizations, Feinman said. They said the committee will analyze the results of the survey and use the data to set future goals. Jocelyn Jacoby, co-president of Students Against Sexual Assault, said it was important that the town hall created a larger discussion of the issue and that people left with goals that they want to discuss with their organizations. Jacoby said she hopes to see all organizations on campus talking more about sexual assault prevention. It’s hard to know what to prevent if you don’t know where the community is at and what they need. University spokeswoman Maralee Csellar said in an email that the committee supports the students’ work to organize the meeting and find out how their peers feel about sexual assault education. “The meeting was a student-only discussion and we are glad that students were presented with a forum to be able to engage in dialogue in an open supportive environment,” she said. Csellar said the committee will use the information gathered from the town hall to brainstorm ideas about how to remove real or perceived barriers to reporting instances of sexual assault and improve processes, trainings and communication. Members of the committee are required to sign confidentiality agreements, and reports that come from the committee are generally not available to the public. Csellar declined to comment on whether the committee will host more town halls in the future, how administrators would be involved, what is discussed in committee meetings, how many reports have been produced from the committee since it launched and if the committee will hold events other than town halls. Kalpana Vissa, co-president of Students Against Sexual Assault and a member of the committee, said students reflected on how they could take leadership roles in their own communities to look after each other. “I think that it’s just up to us as advocates and students to make sure that people at our campus are getting the resources that they need and deserve,” she said. Kei-Matthew Pritsker, a member of the committee and SASA peer educator, said the town hall will help the committee better understand how student groups are preventing sexual assault. He said he hopes the results will tell them which communities are most impacted by the issue. I think that it’s just up to us as advocates and students to make sure that people at our campus are getting the resources that they need and deserve. “I would say this is a huge accomplishment, definitely the largest and most engaging conversation on this topic in recent memory, so it is definitely a good start,” Pritsker said. Pritsker said some questions in the second campus climate survey on sexual assault were not worded properly and couldn’t give a full understanding of the issue, like asking graduate students about whether or not they had been harassed on campus, when the majority live off-campus. He said that having events like this one could help reach more populations that otherwise don’t get to discuss topics like sexual assault. The results of the second campus climate survey were released in September and did not distinguish between graduate and undergraduate students. After releasing the results, officials said they would distribute the survey every other year going forward.